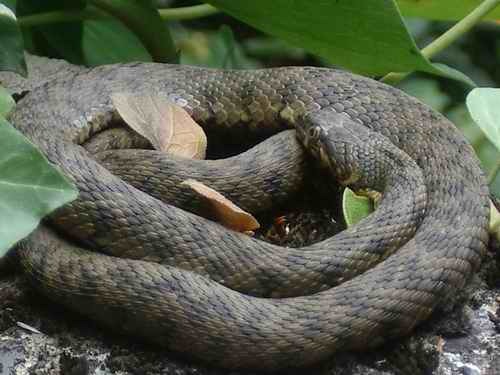 Natrix maura -Viperine Snake. Looks as if it is about to slough. Well marked specimens look incredibly like vipers, especially when they spread their head in a threat display. Some have very viperish zig zag markings whereas others are more like Dice Snakes and some are striped. Surprisingly they will eat earthworms. The give away is the round pupil and the eyes placed near the top of the head showing it to be aquatic in nature. Snakes musk. More serpentine words here on this snake glossary here . 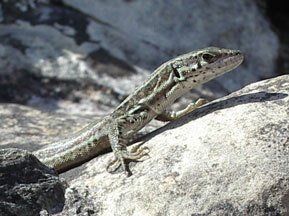 A foul smelling substance produced by scent glands in the base of the tail of some reptiles. Discharging musk out the vent may discourage an attacker. Note: In Spanish it’s a Culebra viperina .